We are not a family of adventurous eaters. We are not “foodies” although we like food and we love to eat. But I’d say we like “familiar” food. Mike is probably the most adventurous out of the 5 of us…unless it’s a vegetable…then I’m the most adventurous. Mike and I love Thai food and I cook with enough common Thai ingredients (like curries & coconut milk) that the kids are somewhat familiar with the tastes. 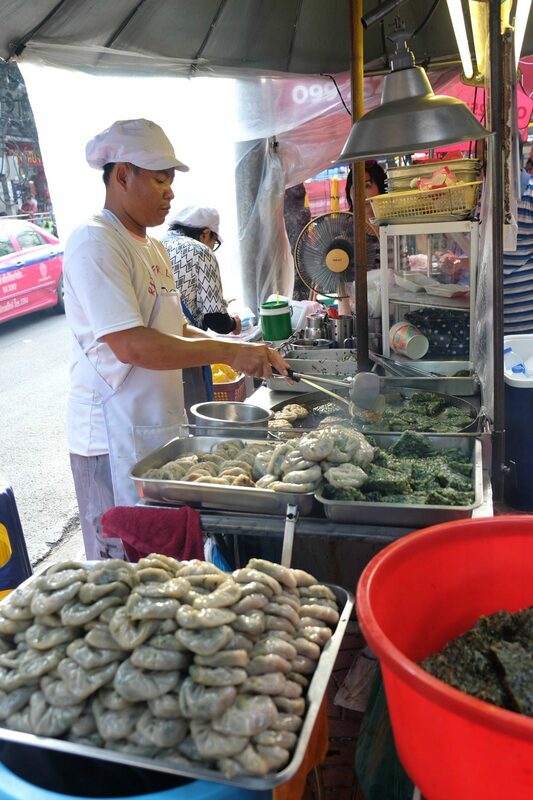 Everyone talks about the amazing street food in Thailand. We were excited to try it, but we were also a little overwhelmed by the endless choices. What if we stopped at a cart selling “just ok” pad thai when an amazing cart was around the corner? 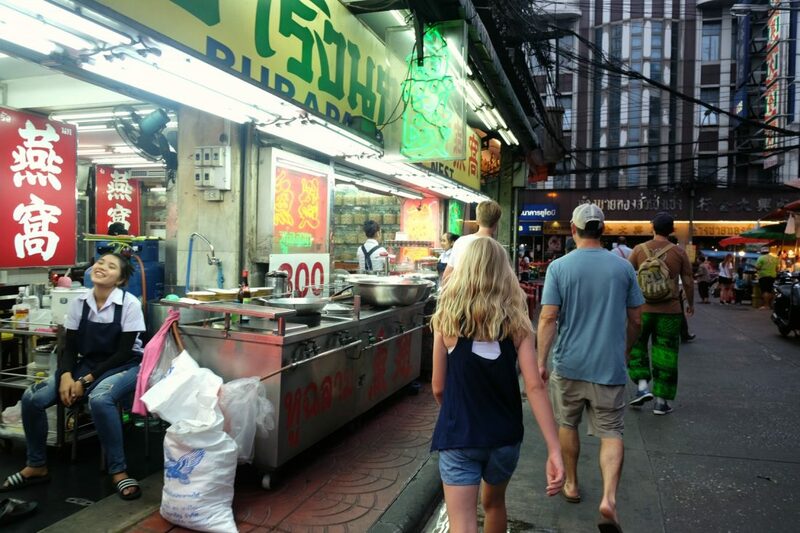 We figured the best way to experience it was to go on a street food tour with a local who could show us the best places. Even though we were a little bit nervous about having some unfamiliar dishes thrown at us, we decided to just go for it and gave the kids a big talk about “having an open mind and trying new things”. 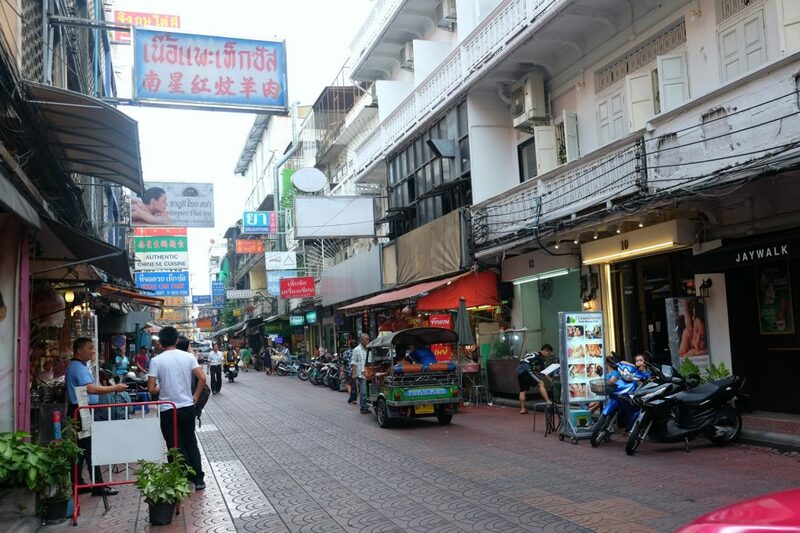 We met Chef Nutth from A Chef’s Tour at 4:30pm under the famous Chinatown Gate on Yaowarat Road. We had quick introductions and he explained we would have 16 courses in about 4 hours. The 16 courses included snacks, refreshing drinks, main courses and sweet desserts – good thing we came hungry! 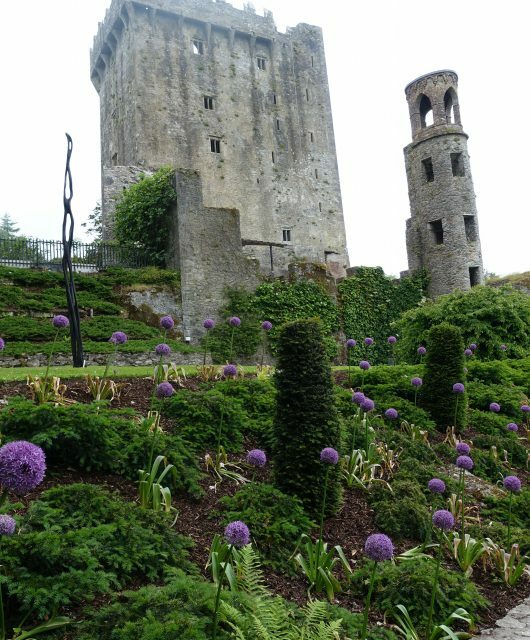 Each tour is limited to 8 guests; we had one other couple on our tour. I booked this tour about 3 weeks in advance and luckily my preferred date was available. 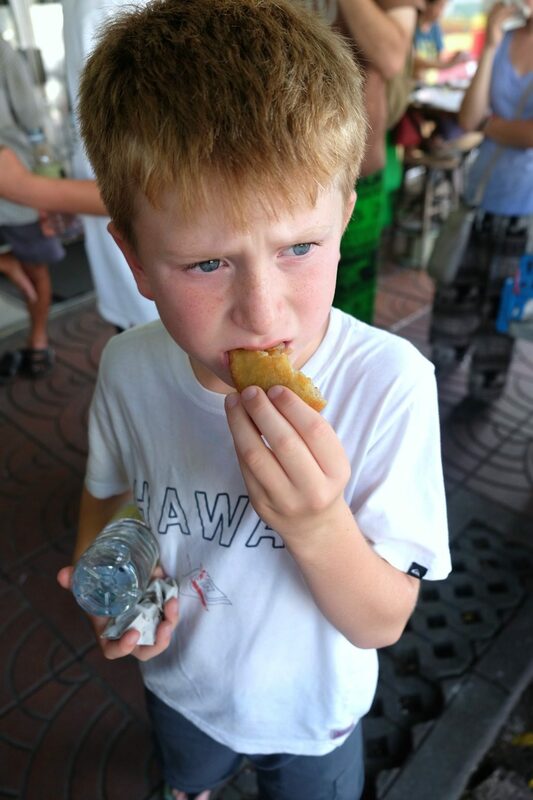 Our first stop was just a little snack – a fried piece of dough with some vegetables inside. Please note the furrowed brow on my 8-year-old. At this point the kids were all skeptical about us trying to trick them into eating something we knew they wouldn’t like. He very much enjoyed the snack despite his look of concern. Chef Nutth explained each dish (telling us exactly what we were eating) as we went along. He knew all the vendors & chefs and gave us a story behind each dish or chef we encountered. Some vendors had been serving the same dish from the same spot for multiple generations. 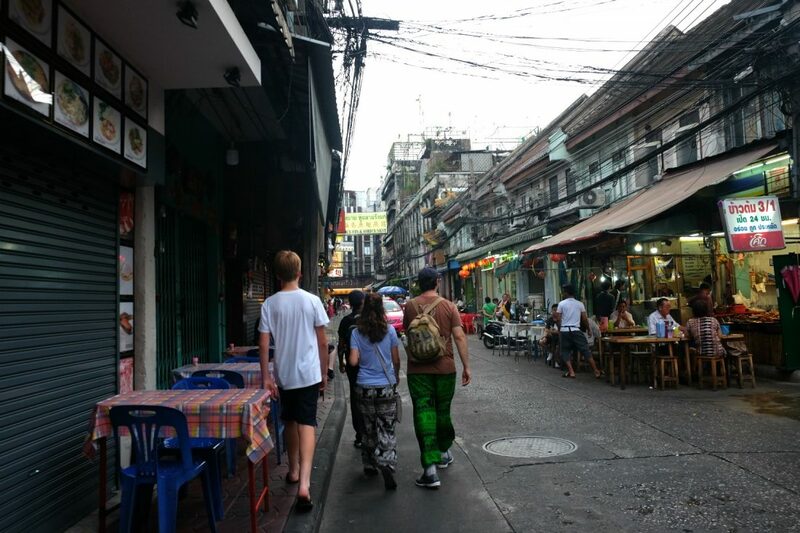 Chef Nutth quickly navigated up & down streets and through a maze of alleyways. 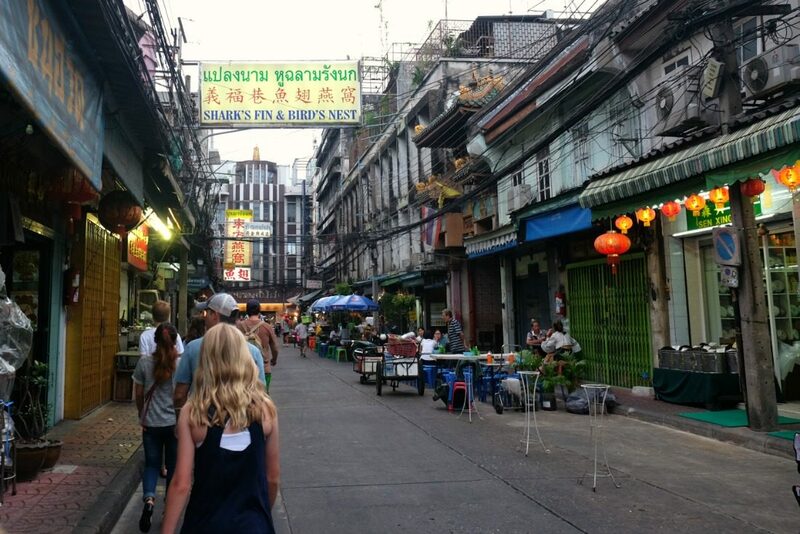 It was so fun to get off the tourist path, eat with all the locals and see this authentic side of Bangkok. At some of our stops our table was set up right alongside a busy road! 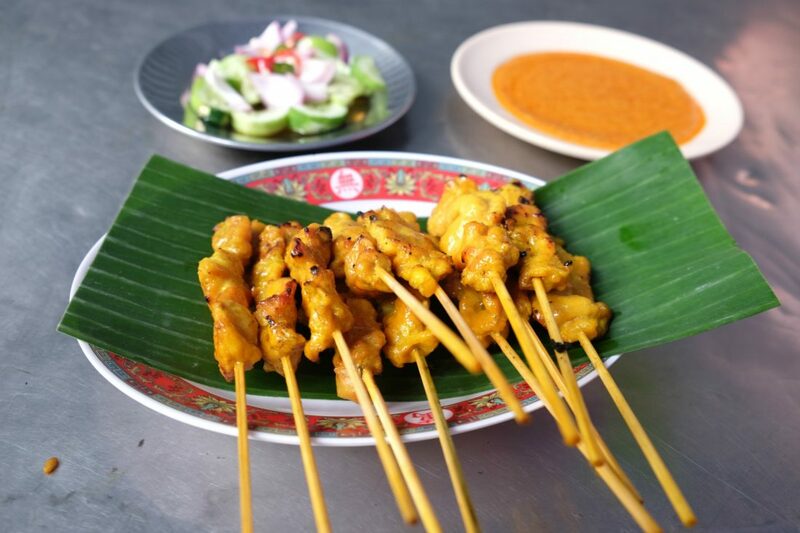 One of our favorite dishes on the tour was chicken satay with peanut sauce and a cucumber salad. We really tried to pace ourselves so we could make it through all 16 courses. Sometimes it was hard to stop eating a dish after barely making a dent in it because it was so good. But we knew if we finished each dish completely we’d never make it to the end of the tour. I think the chicken satay was the one dish where the kids couldn’t help themselves and polished it off! 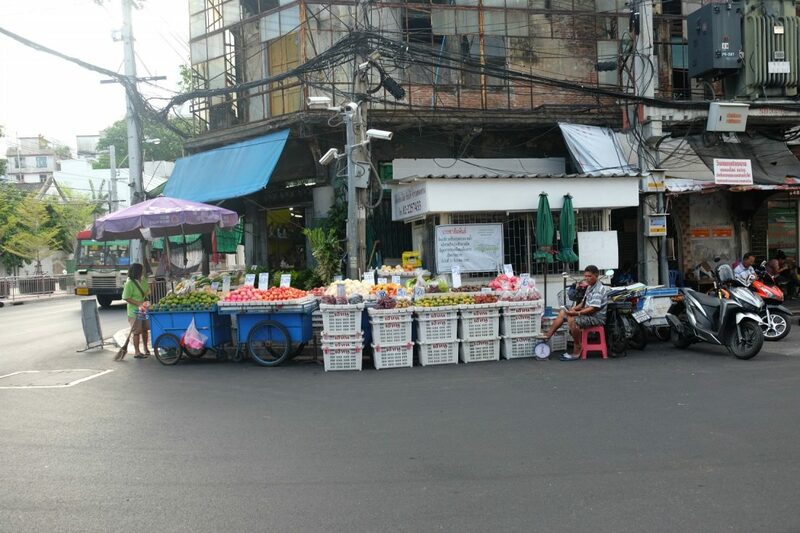 There was lots of fresh produce in Bangkok – and lots of markets set up along the streets. Another favorite dish was “Worker’s Soup” – a large bowl of greens, stewed pork and egg noodles – said to be a hearty meal to get the “workers” through a busy day. 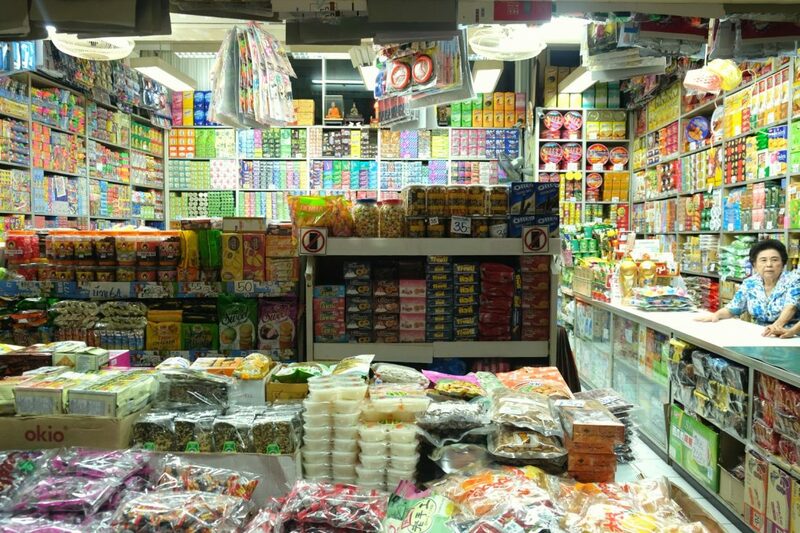 This vendor was hidden within the winding alleys of a covered market. We never would have found this place without Chef Nutth! The kids really did a great job eating with chopsticks on this trip. Even when they were offered a fork, they opted for chopsticks. 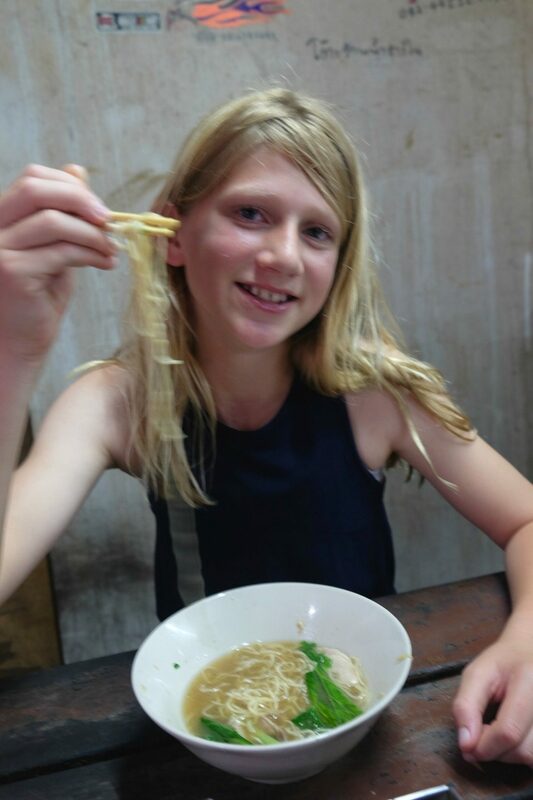 Eating noodles in a hidden alleyway we never would have found on our own! The kids were all pleasantly surprised that most foods were recognizable to them – most dishes were vegetarian, or had chicken, pork or shrimp. As we were feeling confident about trying new spices and food presentations, Chef Nutth threw us for a loop. 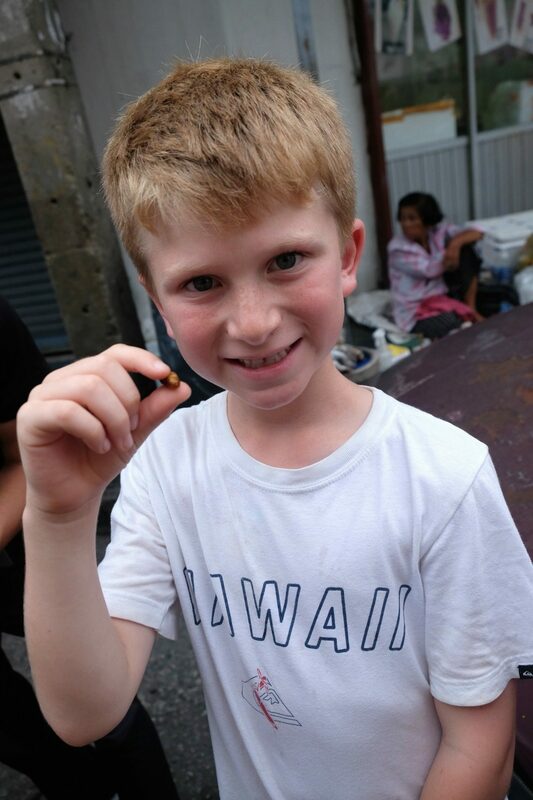 We stopped by a vendor on the side of the road and Chef Nutth asked us how we felt about trying crickets. The other couple on our tour quickly said they were up for it. Then Mike. 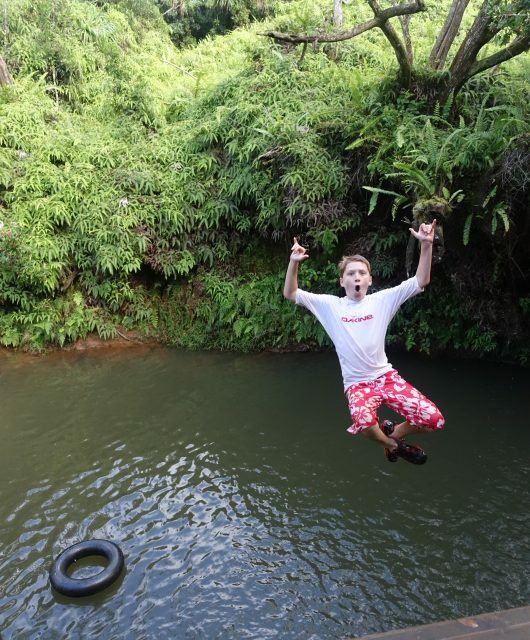 Then our 13-year-old. And finally our 8-year-old. 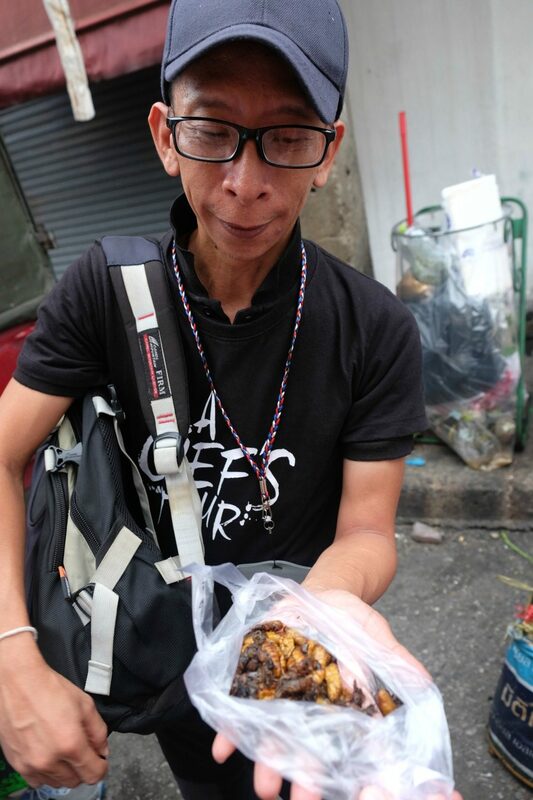 Chef Nutth returned with a bag of crickets & silk worms. The consensus among everyone was “not bad”. In fact, most went back for seconds. 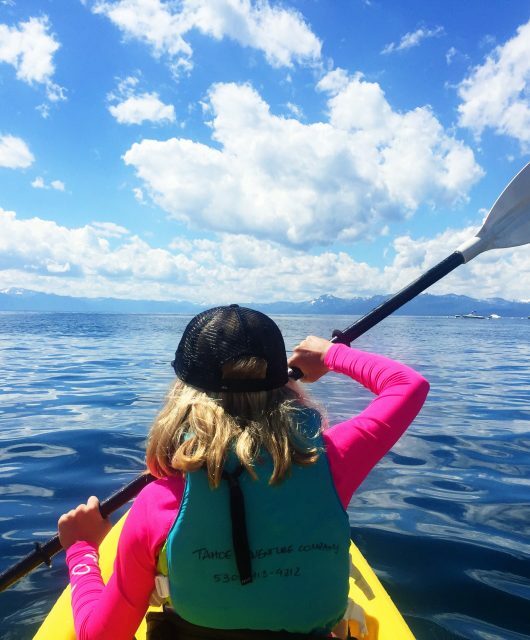 Our 11-year-old considers herself the daredevil of the family and I think she did not like being upstaged. She begged me to try a cricket with her. Figuring I should probably follow through on my speech about “trying new things”, I agreed. We each held a cricket and planned to eat it on the count of “three”. My daughter counted down, I popped it in my mouth and realized she had tricked me and was still holding hers. It really wasn’t bad at all. Once I got past the fact it was a cricket, it just tasted like beef jerky. She finally did follow through with her end of the bargain. The picture below pretty much captures her internal struggle to eat it. 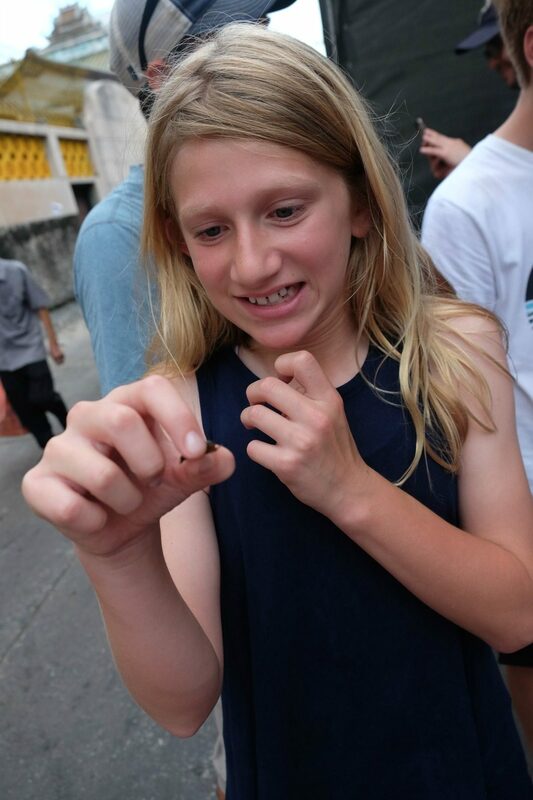 Neither of us was brave enough to try the silk worm though. Cricket – to eat or not to eat? Another favorite stop was a bowl of curried chicken & vegetables over rice. 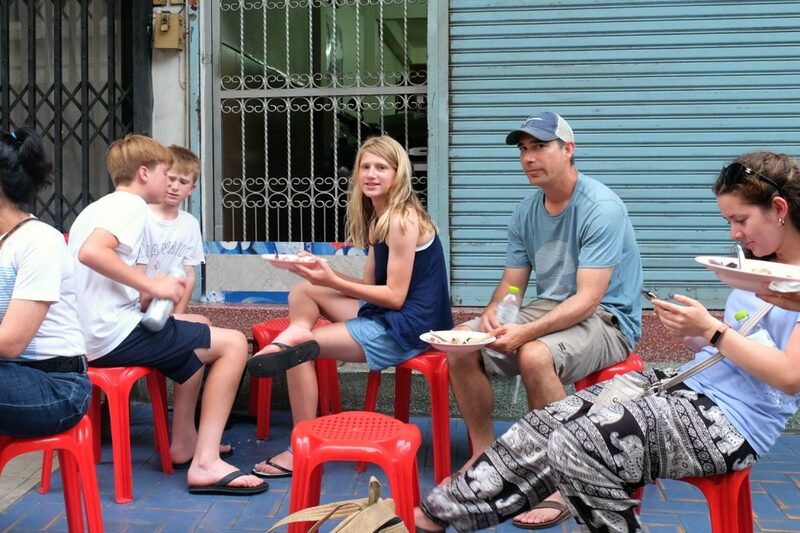 It was also fun to sit on stools on the side of the road eating with the locals. I am happy to report that we tried neither Shark’s Fin nor Bird’s Nest Soup while on our tour (or at any point on our trip). I never saw Shark’s Fin Soup on any menu, but we did see Bird’s Nest Soup fairly often. When we were in southern Thailand, we saw a handful of caves with scaffolding all around them and we learned this is where people go to collect the nests for the soup. Our 8-year-old’s favorite stop of the trip was this colorful shop where Chef Nutth bought us a popular sweet peanut candy. It was pre-packaged and basically crushed peanuts with sugar. We all enjoyed it, but our littlest still talks about it months later! I found it on Amazon, but it hasn’t been in stock yet – maybe in time to surprise him for Christmas or his Birthday! This store had the best peanut candy! As the sun set, we wrapped up our tour with some desserts. We stopped at one store that sold basically only soy sauce, but they also made a soy sauce ice cream which we tried. It tasted like salted caramel and we all (surprisingly) loved it! We also tried mango & sticky rice and the grand finale was a Michelin rated street cart (I’m not kidding!) serving patongo, a deep fried dough. 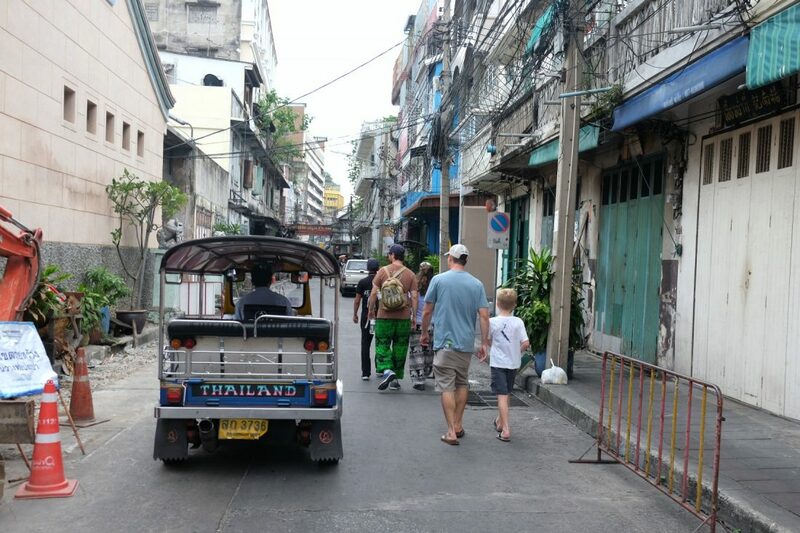 We later saw patongo at some hotel breakfasts, but none compared to the deliciousness of the Bangkok street cart! Yes, absolutely! The cost was $55/adult and $27.5/child (3-12), plus we tipped Chef Nutth for an awesome experience. 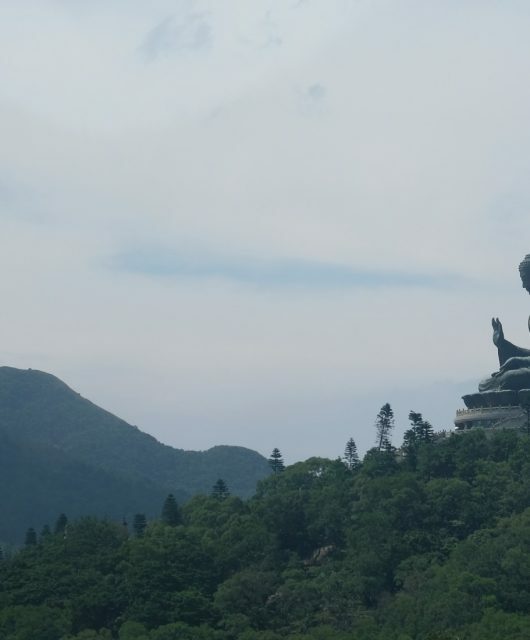 We felt we definitely got our moneys worth for all the food we ate, the expertise we gained, and the benefit of having a local take us only to the best places that we certainly wouldn’t have found on our own. 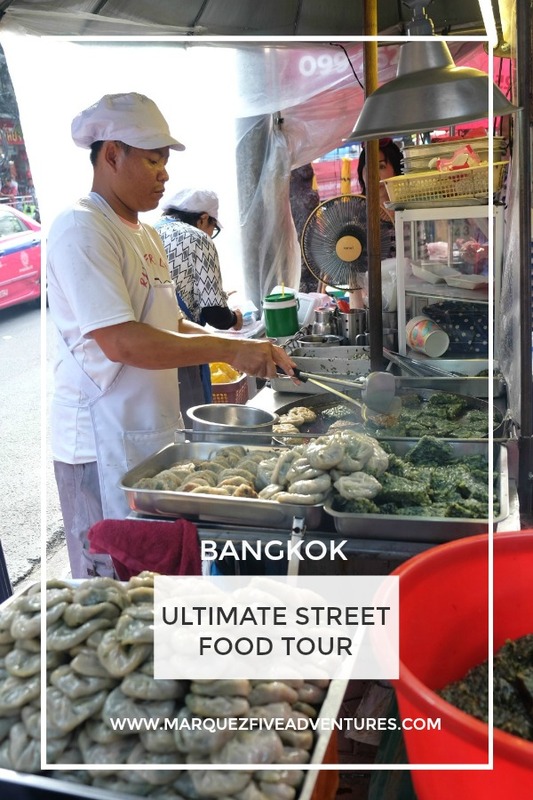 If you are in Bangkok, I highly recommend going on a street food tour! 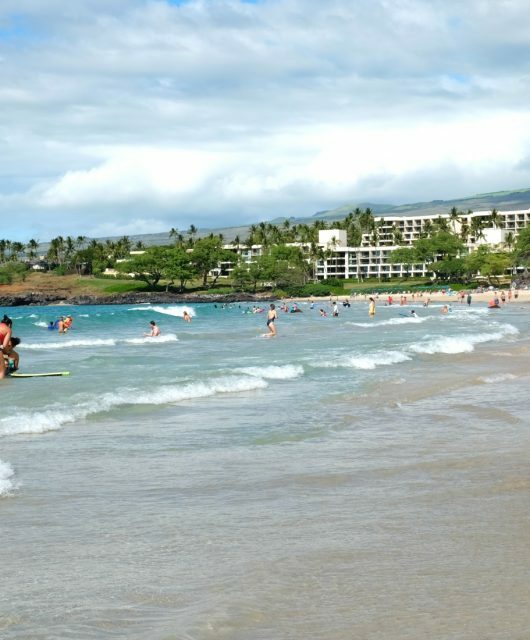 This was one of the highlights of our entire 3-week trip (for all of us) and it’s one of the things we find ourselves talking about the most when asked about our trip. 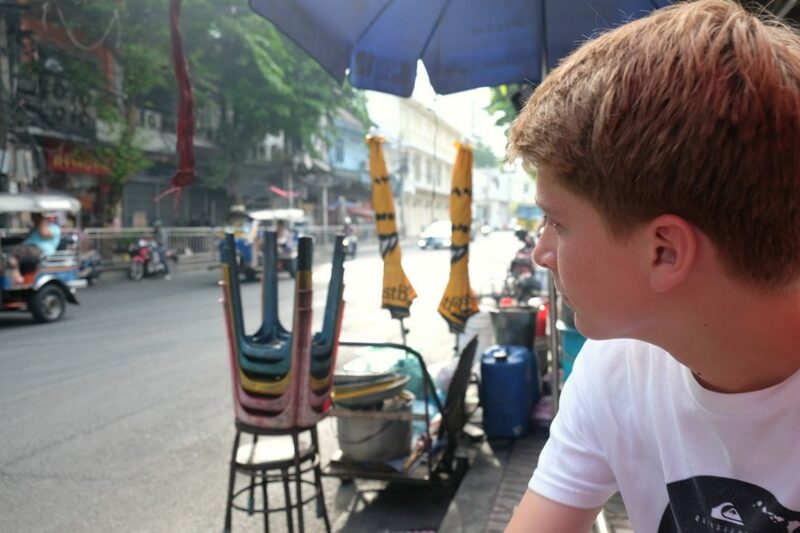 It was such a great way to learn about Thai culture and feel a little bit in the know, like a local.  We all unanimously agreed that food tours will be one of our go-to activities on future trips. 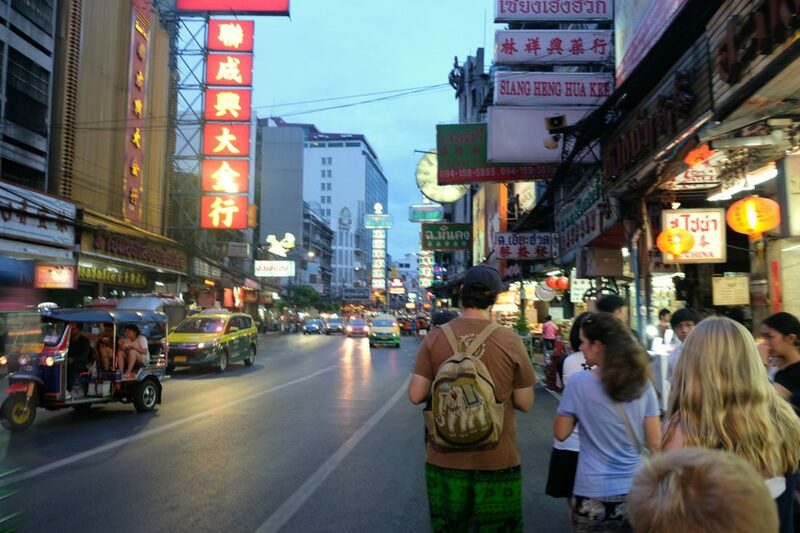 The post for our entire trip to Thailand is here.